111 Marlborough is located on the north side of Marlborough, between Clarendon and Dartmouth, with 109 Marlborough to the east and 113 Marlborough to the west. 111 Marlborough was designed by architect Charles K. Kirby and built ca. 1872, for speculative sale, by James Henry Standish, a carpenter and builder, one of a pair of houses (109-111 Marlborough) designed in the same style, but with 111 Marlborough faced with brownstone and 109 Marlborough faced with brick. 109 Marlborough was built slightly earlier, ca. 1871, at about the same time as 105-107 Marlborough, also designed by Charles Kirby. James Standish purchased the land for 111 Marlborough on June 14, 1872, from attorney Edward Ingersoll Browne, who had purchased it from the Commonwealth of Massachusetts that same day. 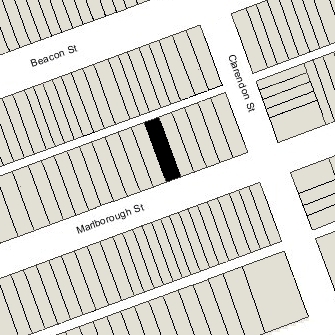 On July 9, 1872, Charles Kirby sold James Standish a six inch strip to the east under half of the already-constructed party wall of 109 Marlborough. Click here for an index to the deeds for 111 Marlborough. On April 16, 1873, 111 Marlborough was purchased from James Standish by Clara Louisa (Page) Barnes, the wife of woolens dealer Charles Benjamin Barnes. They previously had lived at 150 Boylston. The Barnes’s four children — Edith Page Barnes, Clara Fessenden Barnes, Mary Page Barnes, and Charles Benjamin Barnes, Jr. — lived with them. Clara F. Barnes married in December of 1887 to Benjamin S. Blanchard, a physician, and moved to Brookline. Edith Barnes died in January of 1892. Charles Benjamin Barnes, Jr., married in November of 1887 to Josephine Lea Low. After their marriage, they lived in Hingham. Clara Barnes died in June of 1904. Charles Barnes continued to live at 111 Marlborough with their daughter, Mary. By 1909, they had been joined by his sister-in-law, Miss Ellen M. Page. Ellen Page died in March of 1912 and Charles Barnes died in June of 1912. On September 5, 1912, 111 Marlborough was acquired from Charles Barnes’s estate by his daughter-in-law, Josephine (Low) Barnes. Charles and Josephine Barnes made it their home. They previously had lived at 398 Marlborough and also continued to maintain a home in Hingham. Mary Barnes continued to live at 111 Marlborough with them until about 1915. Charles Barnes, Jr., was a lawyer and also served as president of the Hingham and Nantasket Steamship Company. On March 5, 1923, Josephine Barnes transferred 111 Marlborough into her and her husband’s names. Josephine Barnes died in December of 1946. 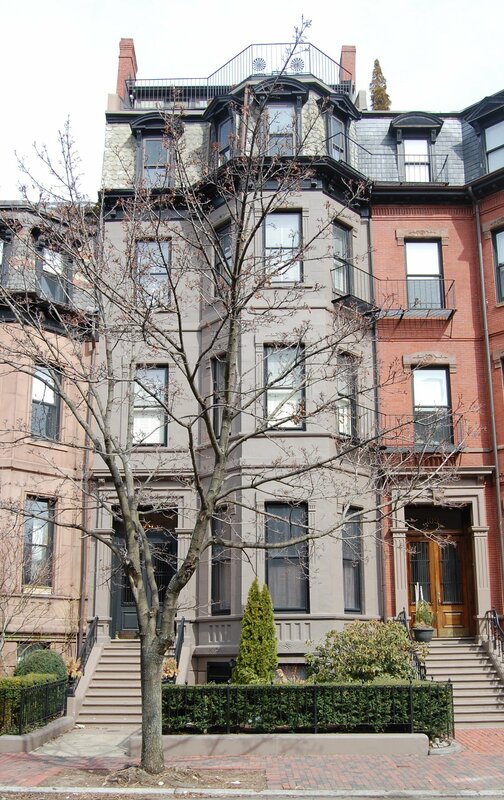 Charles Barnes continued to live at 111 Marlborough and in Hingham until his death in August of 1956. On April 30, 1957, 111 Marlborough was purchased from Charles Barnes’s estate by Theodore Higier and his wife, Patricia Kent Higier, of Cambridge. In August of 1957, he applied for (and subsequently received) permission to convert the house from a single-family dwelling into eight apartments. The property subsequently changed hands and on July 26, 1979, was purchased by Farshid Hodjat and Fred B. Wilcon, trustees of the 111 Marlboro Trust. 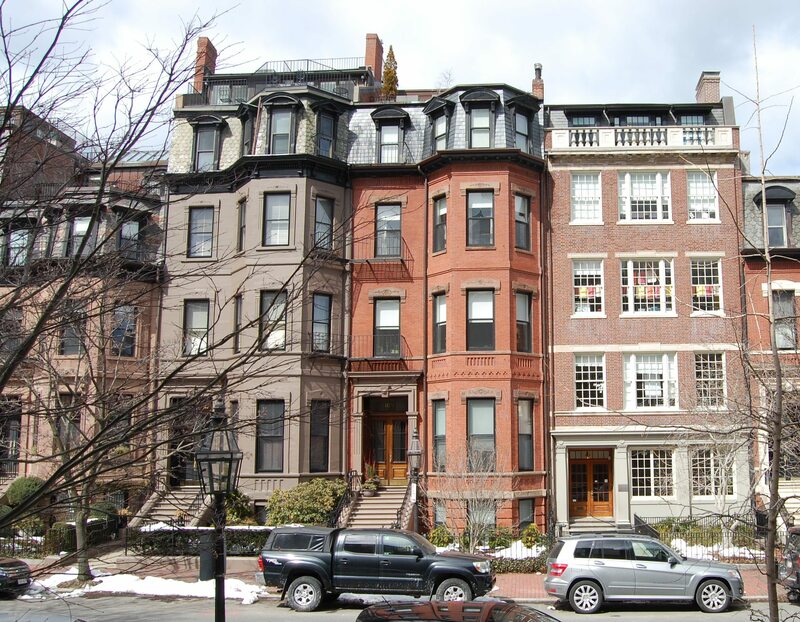 In March of 1979, they applied for (and subsequently received) permission to reduce the number of units from eight to five, and on August 28, 1980, they converted the building into five condominium units, the 111 Marlborough Street Condominium.